Found this cocktail from Chicken Angel but we changed it a bit. Its a tribute to the Henchmen in the Merman series...man those guys look like trouble. a dash or two of Crystal sauce or any hot sauce you like and adjust to your hot level. Shake with ice, strain and serve in a cocktail glass. 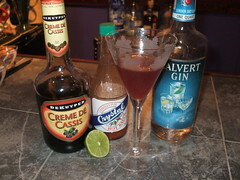 It is a very interesting drink and much better than you would expect. Much like a Shrub that uses vinegar. We served 6 and everyone liked it. Give it a shot.